Zhanjiang Port once again reached the top 10 in China for cargo throughput, leveraging the Hong Kong Merchants Group's advanced management concepts, operational networks and other resources. The port, which began operations in 1956 under the approval of the State Council, is one of the nation's proudly locally designed modern deep-water harbors. Decades of development has allowed it to grow into a major export gateway for southern and southwestern Chinese goods destined to Southeast Asia, Africa, Europe and Oceania. In 2007, Hong Kong Merchants Group forged a partnership with Zhanjiang Port, which not only prompted its opening of a land port in Qiandongnan Miao and Dong autonomous prefecture, but also more frequent exchanges with sister ports along the 21st Century Maritime Silk Road ever since. Meanwhile, the enterprise has also helped Zhanjiang Port complete the industrial chain by ramping up cooperation with international suppliers, logistics companies, shipowners, merchants and agencies. Also noticeable is their joint efforts in constructing port clusters that will serve as strategic strongholds along the Belt & Road. 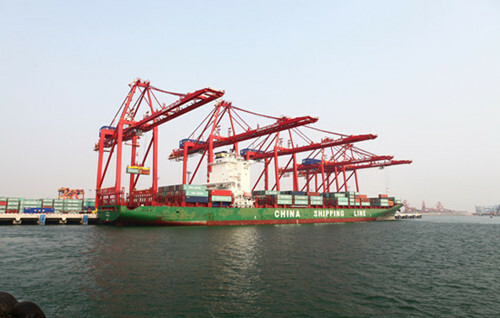 Over the previous year, more than 280 million tons of cargo has made its way through this southern Chinese port. According to Liu Enhuai, the president of Zhanjiang Port Group, both sides will spare no effort in assisting the port's cargo throughput to reach 300 million by the end of 2018. The goal seems to be on track in 2018 with the construction of a passenger-cargo ro-ro (roll on/off) at Xuwen Port and a 400,000-ton-class shipping lane.